By default newer versions of PowerPoint default to 16:9 for new presentations. If this is not what you want you can create a 4:3 (or whatever) potx file named blank and place it in <APPDATA>\Microsoft\Templates\ - This will open as the default new presentation but you can only choose ONE design. A possibly better solution is this completely free AddIn which allows you to choose the default size as 4:3, 16:10 or 16:9 for all new files. It is only for Desktop PC versions from 2010 not Macs or online versions. It is free but no support or guarantees. Simply download the installer and run with PowerPoint closed. Next time you open you should see the new DEFAULT SIZE Tab. 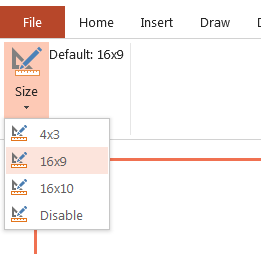 The size set is retained until you change it. NOTE changing the default does NOT change the aspect ration of open presentations.